The Shaykh (May Allaah preserve him) is well known to the major scholars and studied with several of them, including Shaykh Rabee’ ibn Hadi al-Madkhalee and Shaykh ‘Ubayd al-Jaabiree (May Allaah preserve them). He is highly recommended, specifically, by Shaykh Rabee’ al-Madkhalee (May Allaah preserve him). TheShaykh delivered an extremely beautiful lecture full of athaar (narrations from the salaf). He expounded on many of the signs and characteristics of the people of innovation. Throughout history, the ways of the people of innovation has been apparent to the scholars of Ahl Sunnah wal Jama’ah; however, in our time, the ability to distinguish haqq (truth) from baatil (falsehood) has become unclear to most muslims, especially since many of the innovators and deviant groups use clever ways to penetrate the hearts and minds of the people of the Sunnah, like labeling themselves with praiseworthy descriptions such as salafi, athari and ahl-hadeeth etc., when they are the furthest from the methodology of the salaf-us-saalih (righteous predecessors). Alhamdulillah we have the people of knowledge, who have not been deceived by these tactics but have the insight into the tell tale signs of the people of innovation. With the aid of our scholars, who equip us with the necessary tools to recognize these people, we can steer clear of their misguidance and be on guard against their infiltration amongst our ranks. The noble Shaykh Khalid ibn Dhawi adh-Dhufayree (May Allaah preserve him) elaborated on several of their characteristics and exposed some of their deceptive ways. 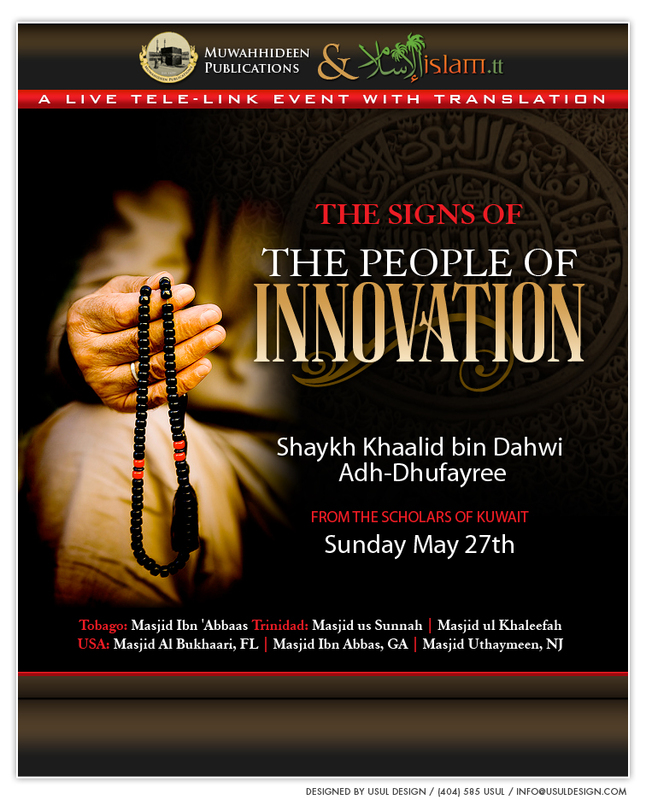 The Shaykh detailed some of the major signs of the people of innovation, as their signs are plenty, with a focus on the more apparent groups and personalities from amongst the people of innovation, like the khawarij and their spokesmen in our recent times ‘Abdullaah Azaam and Sayid Qutb. MayAllaah, Al-Haqq show us the truth and make it easy for us to follow it and show us the falsehood and make it easy for us to distance ourselves from it.